You can pamper your kitty and be creative in the kitchen at the same time when you use homemade cat treat recipes to cook up something tasty. From catnip biscuits to holiday cheese balls, these recipes let you make your own irresistible treats and show your kitty how special he is. 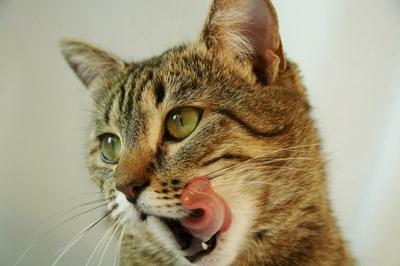 While these recipes for baking cat treats provide healthy snacks, they are just that - snacks. They shouldn't be used as a substitute for a regular balanced diet. Similar to meatballs, your cat will find this recipe difficult to resist. Using your hands as you would when making meatloaf, mix all ingredients together in a large bowl. Shape the mix into individual golf ball-sized nuggets, and arrange them in a non-stick baking pan. Bake for approximately 20 minutes until the balls are nicely browned and reach an internal temperature of 160 degrees F.
Cool before serving. Freeze the leftover balls and reheat in microwave as needed. Your cat will love these biscuits. Stir dry ingredients together in a large bowl. Mix in wet ingredients to form a soft dough. You can add a little more flour if the dough is too sticky. Turn out dough onto a non-stick baking sheet and roll out. Carefully cut the dough into bite-sized squares. Bake for approximately 20 minutes or until golden brown. Remove treats from the tray, making sure to break them apart; let them cool on a backing rack. Store in an air-tight container or freeze and thaw as needed. Your cats are sure to love the flavor of this quick and easy treat. The recipe is small so you can make it fresh anytime you want to give your pets something special. Slide the food from the can in one piece. This is sometimes easier if you remove both the top and bottom of the can, and gently push the contents out. Next, cut into 1/4-inch slices using a sharp knife or cheese slicer. Lay the slices about 1/2-inch apart on a cookie sheet, and bake at 325 degrees in the oven until crispy. 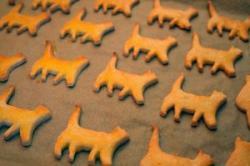 Once cooled, serve these tasty cookies to your pet. They will keep a week or two in an air-tight container stored in a refrigerator. Why should humans have all of the fun during the holidays? If your pet craves cheese and can't keep his or her paws off of the cheese tray, try this cat-friendly variation. Combine the first three ingredients until well blended. Add the flour mixture slowly to the first three ingredients, mixing until a soft dough ball is formed. Separate into 1/2-inch pieces and roll by hand into small balls. Place the balls on an ungreased cookie sheet, and bake at 300 degrees F for approximately 25 minutes. Yield: Approximately 12 balls. Cool completely before serving. What cat doesn't enjoy a little tuna now and then? This quick recipe will give your pet plenty of tasty tuna treats to enjoy for several weeks if stored in an air-tight container in a cool place. Grease a cookie sheet with margarine or use one lined with a silicone sheet. In a bowl, mix the flour and powdered milk together. In a separate bowl, combine the tuna and egg together, mashing the tuna until it is no longer chunky. Add the tuna mixture to the dry ingredients, and add the water a little at a time until a slightly sticky dough ball is formed. Using two spoons or a small cookie scoop, create balls and place them about one-inch apart on a non-stick cookie sheet. Cook in the oven at 350 degrees F for approximately 25 minutes. Cool completely before serving to your pet. Substitute pureed, cooked chicken combined with one tablespoon of cod liver oil for the tuna packed in oil. Once you're comfortable with making these recipes, don't be afraid to experiment a bit. Well-drained tuna makes a great substitute for turkey, and you can try substituting different kinds of flour until you create a treat with the texture and taste your pet truly loves. Just figure out what your pet's favorite flavors are, and try incorporating them into your recipes. It's really a process of trial and error, but you never know when you'll come up with something fabulous. Baking for your pet can be a real pleasure, and your cat will surely appreciate the special treatment.